As of today, throw pillows are available from my online gallery. 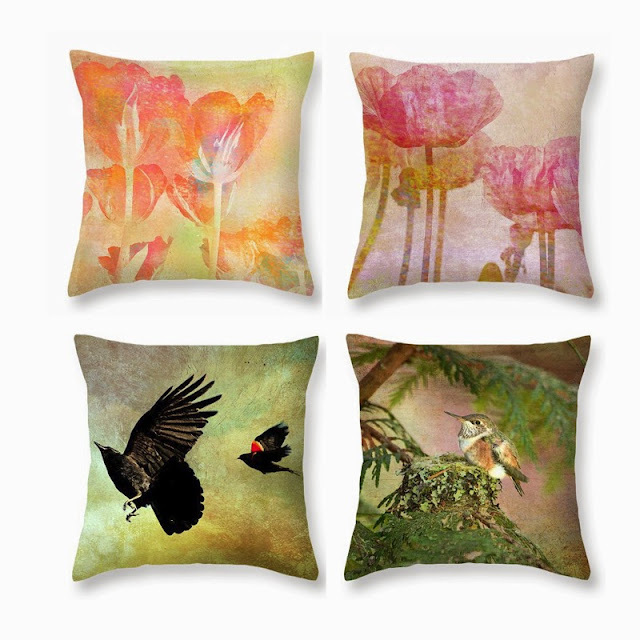 You can have a pillow made from any of my photographs, vintage collages or digital art. They come in a variety of sizes ranging from 14" x 14" to 26" x 26" in square size, and 20" x 14" in a rectangular shape. Just click on the links above to see any of the pillows pictured above or go to my gallery and click on any image that you like to see how it looks on a pillow. I think I'm going to have to order a batch of these for myself...I love the look of them! If you're more into graphic type designs, check out my gallery of abstract and digital art which includes colorful mandalas...they look fantastic on pillows, if I do say so myself! Labels: "throw pillows" "nature photographs" tulips poppies hummingbird "baby hummingbird" "hummingbird nest" crows blackbirds "red winged blackbird"
Thank you, Wendy! I think the pillows are a good way to have some art in your home without spending a lot of money.